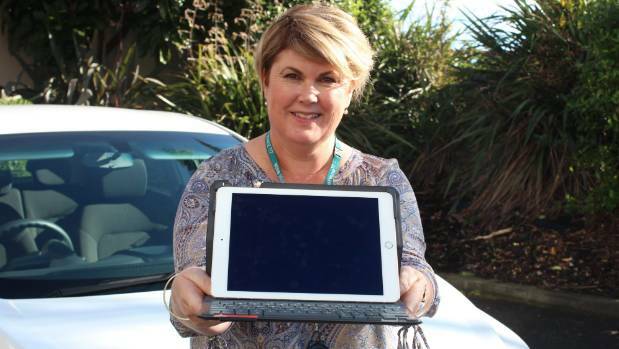 Waitemata DHB speech and language therapist Bridget Oliver says her job on the road is now much easier thanks to a new iPad. Speech and language therapist Bridget Oliver used to lug around books, flash cards, forms and photocopied bits of paper as she visited patients in west and north Auckland. But all that has changed, thanks to generous donations from the community, which funded iPads for Oliver and 121 of her colleagues. A total of $122,000 was raised for the mobile devices last year by the Well Foundation, Waitemata District Health Board’s fundraising arm. 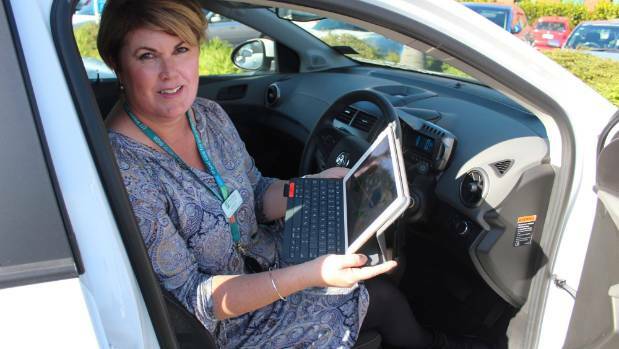 Bridget Oliver says the iPad enables her to spend more time with patients as a speech and language therapist, and less time doing administration. Project manager Kelly Bohot said the iPads were rolled out to clinicians visiting patients in their homes, including dieticians, physiotherapists and social workers. The iPads were an important tool, giving clinicians remote access to DHB records, their emails, and pre-approved apps for therapy and education, Bohot said. The main benefit was allowing clinicians to spend less time on administration and more time with patients. Clinicians added three extra patient visits a fortnight, on average, after six months of mobile device use, Bohot said. For Bridget Oliver, the iPad was “fantastic” for day-to-day use. Oliver helped patients over 65 who had difficulty talking or swallowing, usually as the result of a stroke or a neurological condition like Parkinson’s disease. The iPad was used to show patients things like 3D models of the swallowing mechanisms to help explain the process. Pictures found through Google also made good prompts, she said. “For a patient from Fiji, I needed to start a conversation so we Google Mapped the island where he was from and he could see his church; it made it really relevant for him,” she said. The iPad also meant Oliver didn’t have to go back to North Shore Hospital for administration tasks, meaning more time with patients doing the job she loved. Meanwhile, staff at North Shore and Waitakere hospitals are also taking to technology, with old paper charts being replaced with an electronic eVitals. Waitemata was the first DHB in the country to fully roll-out electronic, real-time monitoring of hospital patients’ vitals, leading the way in Australasia. Clinical lead Peter Groom said the electronic charts were easier to read and understand, and also easier to find, than the old paper charts. Weekly poll: What makes a great camera? How to play PC games on your smartphone?